I've walked by Al Hamra a zillion times without taking a second glance. If you've ever taken Bart to 16th & Mission, chances are that you have as well. There is no real reason to take a second glance, as it looks like any other generic lower end indian restaurant in town. So why did I stop in finally? Easy. They were offering free credit on LevelUp, and a few years ago, I thought it would be fun to use LevelUp to guide my discovery of new places, getting freebies along the way. I started with just trying their simple naan, but, as you'll read more below, it turned out to be delicious, so I returned a few more times. My wait was never long, and service was friendly enough. I never saw any other diners inside, but they seemed to do a reasonable takeout business. The most notable element is the large tandoor oven right near the front entrance, where each order of naan is cooked fresh to order. I never tried the savory food, but the naan alone is worth returning for, some of the best naan I've had in San Francisco. I had some leftover indian food at home, but no naan to go with it, and I had LevelUp credits to use, so on my first visit I decided to just try out the naan. 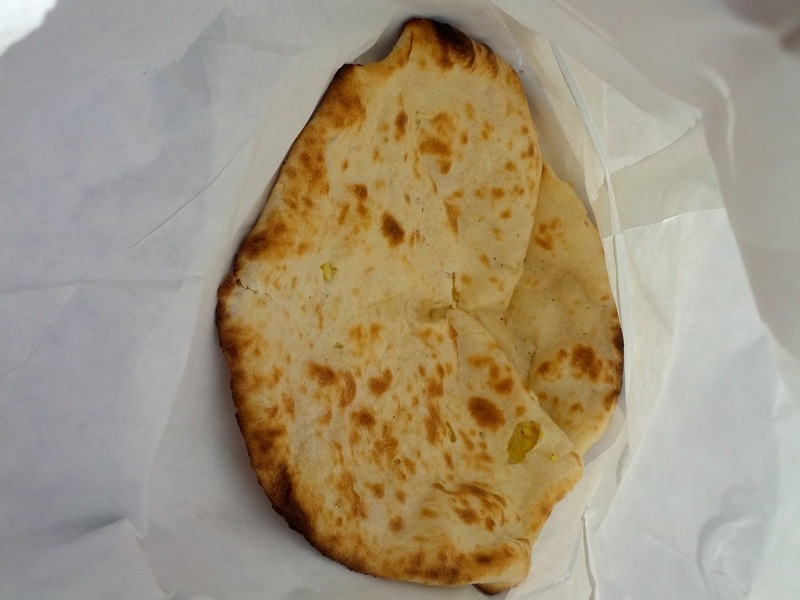 Plain naan is only $1, but I wanted to make it more interesting and went for the garlic naan. It was a great surprise. It was cooked to order - I watched him roll out the dough, stuff it, and bake it while I waited. Rather than being topped with bits of chopped garlic, the naan was stuffed with it. There was tons of garlic. The aroma coming off of it was amazing. It wasn't too buttery or oily, and was cooked pretty much perfectly, not soggy, not too crispy. Really quite well done. The freshness of this I think really made a huge difference, I'm so glad I tried a few bites before heading home with it. I don't think I've ever had naan quite this fresh before. 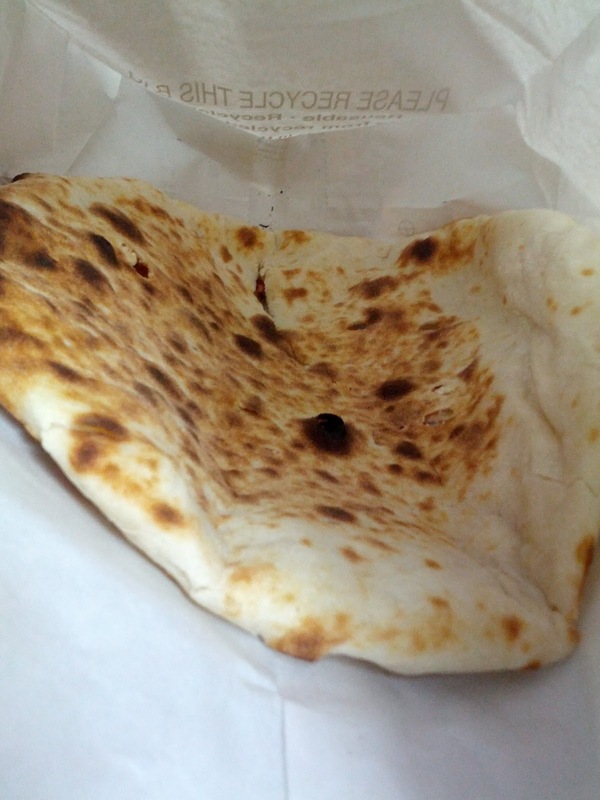 $2.50 is a great price for a naan this size. Since I loved the garlic naan so much, when I was cruising by on another occasion and just wanted a snack, I decided to try out the chili cheese naan, as I figured it could stand on its own as a snack. Its basically a quesadilla, right? It was even more amazing than the garlic naan! Probably the best naan I have ever had in my life. Again, it was made fresh to order. Hot, fresh, perfectly crispy. It was stuffed with cheese and little bits of chili, I think jalapeño. The cheese was perfectly melted and gooey, and there was just the right amount. It was clearly cheesy bread, but didn't feel too heavy, as it wasn't oily or greasy. It had a nice kick to it from the chili. It probably would have gone great with some curry, or dunked in raita, but it was perfectly enjoyable on its own. It was huge, and a great value for $2.50. Totally recommended as a snack if you are in the area. I sorta get where others were going by calling it dessert, as it was stuffed with sugar, coconut, and raisins, but I really can't imagine this as a dessert. Yes, it was sweet, but in a way that would go great with curry, not on its own. I had anticipated it being far more dessert-like, and had a cappuccino to pair it with, and it just did not work. I had to return and get a rice pudding instead. 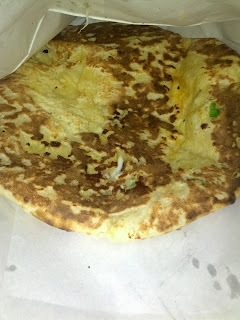 Like all of the other naan I tried, it was prepared fresh, it wasn't oily nor greasy, and was really just quite good. I don't think I'd get this variety again though, but I'm glad I tried it. And like the others, the large piece was only $2, a wonderful deal. 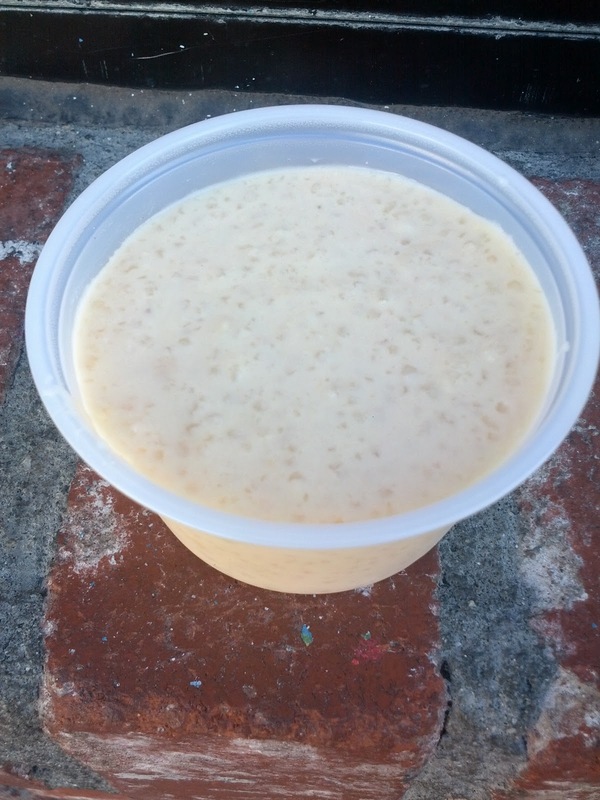 Kheer: Special rice cooked with milk and sugar, served cold with pistachios. $2.00. I'm somewhat obsessed with rice pudding, or, with pudding in general, so I had to try their dessert offering. Anyway, the "special rice" was tiny little bits of rice, perhaps a very short grain rice, or grains that had been cut? The bits of rice were tiny. The pudding had a creamy, albeit watery, milk base, and tiny bits of pistachio in it. Nothing very remarkable. I added cinnamon, almonds, and blueberries to it when I got home, and enjoyed it much more. The portion was tiny, but it was only $2, and it was nice to have a reasonable size portion. The pudding seemed almost identical to the rice pudding from Lahore Karahi. Even stranger, the description of the dish was word for word identical on their menus. Perhaps the restaurants are related? I know that Lahore Karahi was recently sold. 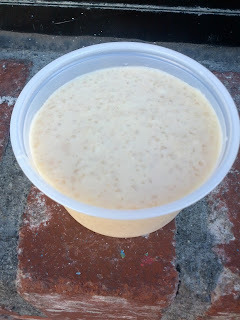 It also seemed really similar to the rice pudding from Darbar. I'm starting to wonder if they all just get it from somewhere? I wouldn't get it again, but at least it was much better than the rice pudding from India Palace. Last week, I reviewed a nicely plated, but mediocre, lunch in the Concorde room at the Heathrow airport, where I stopped en route to Mallorca (and then ultimately Zurich for a business trip). On the way back, I also swung through London, spending 1.5 very quick days at my office there, before heading back through Heathrow. We again headed straight to the Concorde room, now my second time ever in the premium lounge. On our trip through Heathrow before we were there midday, and didn’t have much time, so I didn’t get to fully explore. 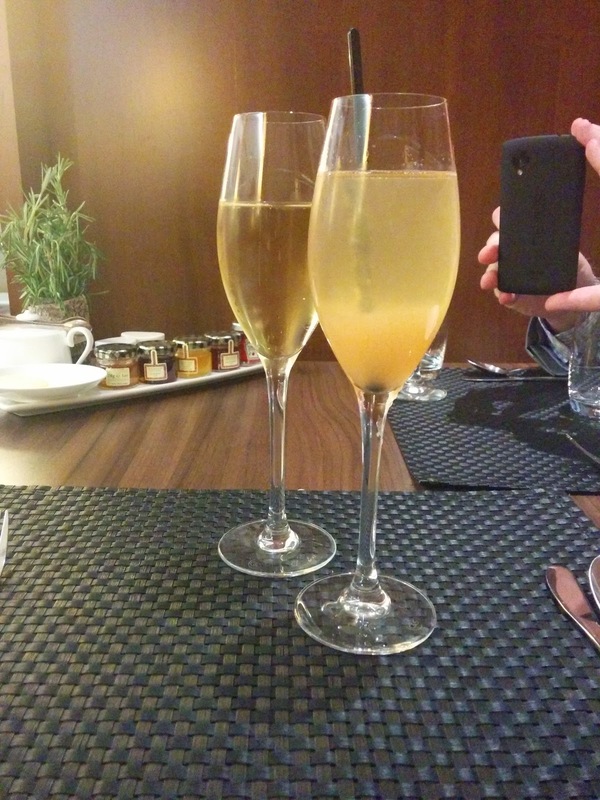 This time, we were originating in Heathrow, and made sure to have extra time for the lounge. 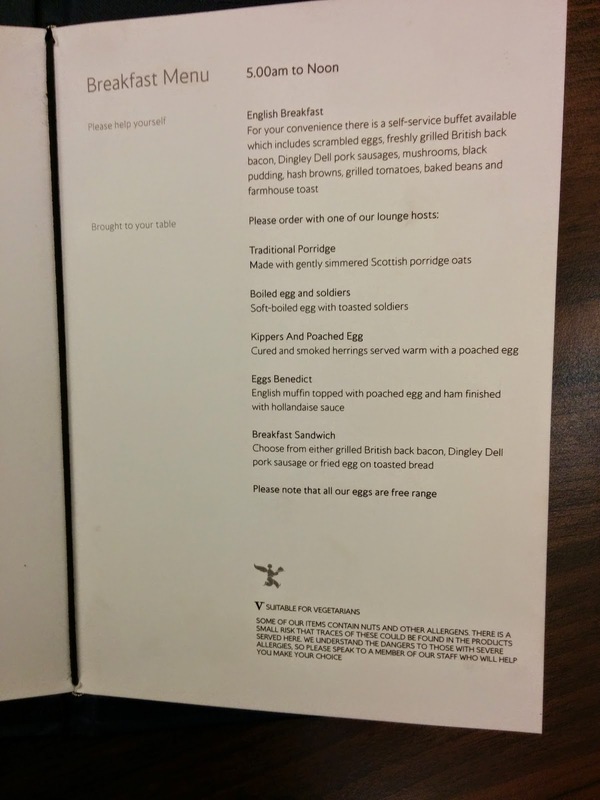 Also, our flight was at 11:30am, so the lounge was in breakfast mode, not lunch/dinner as it was previously. The space, as before, was very welcoming, although far more crowded earlier in the day. There was only one free couch in the entire place when we arrived. Overall, I felt about the same as my previous visit: the space is great, but, the food choices leave much to be desired. Lowlights: The Concorde room aims to serve and pamper, and as such, they don’t have any buffets, or even little snacks you can help yourself to. Since I like to snack, and to try a little of this and a little of that, it isn’t the style that appeals to me. Of course, I do appreciate having a menu of made-to-order items, that can be ordered in the sit down restaurant area or out in the main lounge, but this time, I really wanted to just be able to gorge myself on pastries from a buffet, and they did not offer that. Highlights: What the Concorde room does offer however is calm and tranquility. It is very quiet and subdued. I noticed this on my previous visit, but particularly once I went out lounge hoping (more on that next week!) I realized how striking it was. Everyone in the Concorde room is polite, civilized, respectful of the space and those around them. A complete contrast to the entire rest of the airport, or, any airport really. When I visited the Concorde room on my earlier trip, it was midday, so they were serving the lunch/dinner menu. This time, it was breakfast. The breakfast menu was full of made to order items mostly featuring eggs, like soft boiled eggs & soldiers, kippers & poached eggs, smoked salmon & scrambled eggs, or a full english breakfast with fried/poached/scrambled eggs and British back bacon, sausages, grilled tomatoes, mushrooms, baked beans, hash browns, and black pudding. But I don’t really care for eggs. There were also simple offerings of cereal, oatmeal, toast, and yogurt. Meh. Don't get me wrong, I love breakfast. I love brunch. But the primary reason I love these meals is the sweet carb options. I adore my baked goods! At the bar area were a few pastries you could help yourself to: just basic croissants and muffins. I looked at them, and even to me, who loves most baked goods, even low brow ones, they didn’t look remotely appealing. Completely missing from the menu was any sort of pancakes, french toast, or waffles. Where were my breakfast carbs? Since there was literally nothing I wanted, I decided to relax in the lounge for only a few minutes, and then go explore the other lounges, where I knew they had buffets. Stay turned for that next week. 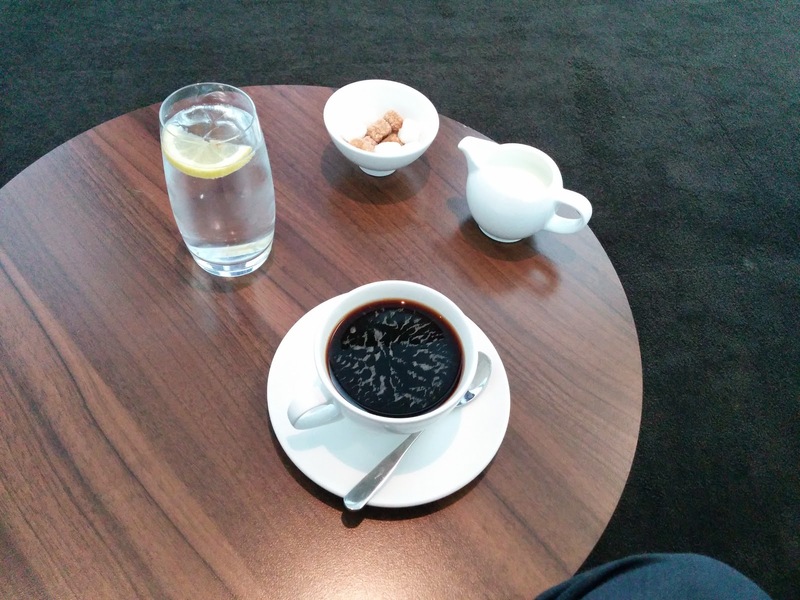 I did however order a decaf coffee out in the casual lounge area. It was fine, unremarkable, which is always saying something for decaf. I appreciated the attentive table service. After a little while of relaxing, before I set out on my journeys, Emil decided to move to the formal dining room for his breakfast. I joined briefly just out of curiosity, not because I wanted anything. I have to admit, the eggs really did look good. Clearly freshly poached to order, served with plentiful smoked salmon, probably the same as he’d had on our last visit as an appetizer. 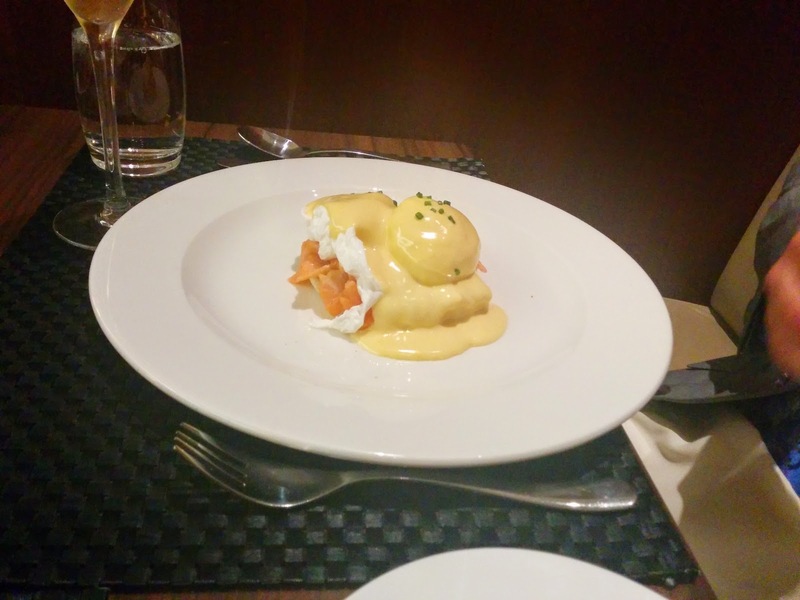 I tried a bite of the hollandaise, since, I can't ever resist a sauce, and it was decent, better than what I've had in many restaurants, although it was a bit more thick and creamy than I am used to. Since I felt lame not ordering anything, I decided to order a Portuguese rice muffin, the only baked good besides the boring croissants. I really had no idea what to expect, but it certainly wasn’t this. 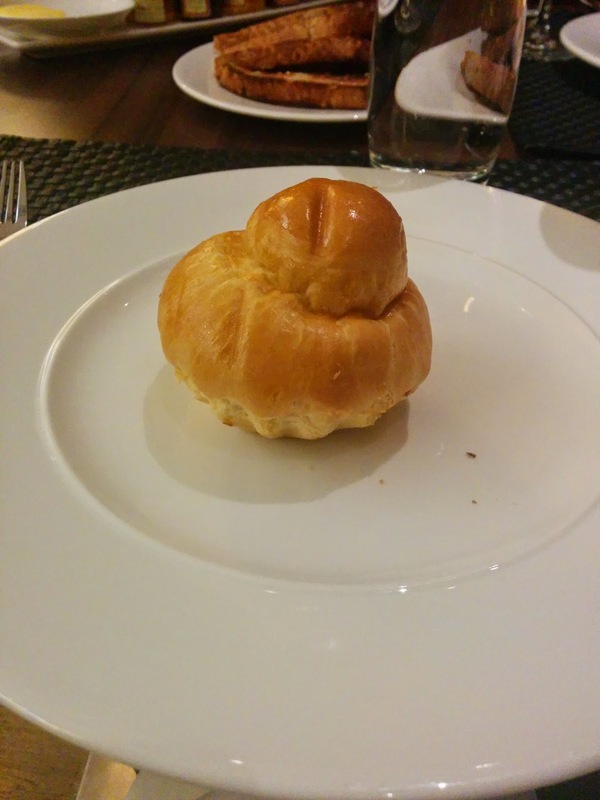 When it was presented to me, I was told it was the “brioche”. Once I went exploring the other lounges, these were included in the buffets, and indeed, they were labelled as brioche. Maybe this wasn't supposed to be a Portuguese rice muffin? Who knows. It was served slightly warm, and there were assorted jams on the table, but otherwise it was really quite boring. It was fluffy, it did have an egg wash making it shiny, but, meh. No reason to eat this. Once I returned from my lounge hoping, we had a few minutes remaining, and decided to finish our stay with cocktails. Yes, it was only 10:30am, but, we were on flying time. Now, let me back up a little. The Concorde room had literally *just* started offering cocktails the week before. Sure, they have always had a great wine and champagne selection, and a full bar, but they didn’t have a cocktail menu, or, as Emil says, they didn’t have staff trained to make "proper cocktails". Now, they have a cocktail menu, with both alcoholic and non-alcoholic options. Many sounded interesting, and in fact, many were suited for brunch, like bloody Marys and mimosas, but I had my eye on the BA175, made with pink grapefruit juice, apricot liquor and Tanqueray No. TEN gin topped with champagne. It was a nice looking cocktail, with an apple-like aroma. It really was totally appropriate as a brunch drink, in the same way that a mimosa or bellini is, as it was quite fruity and included champagne. It just happened to have some bonus gin in there too. I loved how it got sweeter as I drank further and uncovered the apricot liquor, but of course Emil had them dial that down in his glass. A very enjoyable cocktail, and the perfect way to end my stay in the lounge. 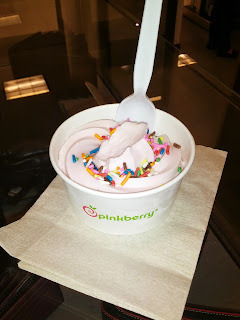 I've reviewed Pinkberry a number of times before, but always with visits to the actual Pinkberry stores. In summary: Pinkberry is decent, not necessarily worth the price, they have some good flavors, and a variety of toppings. Well, this review is about Pinkberry, and about their froyo, yes, but, it is about their catering, which, IS a Monday topic! For catering events, they bring the froyo pre-dispensed, since they obviously can't show up with a froyo machine. This pretty much changes everything. Froyo machines dispense soft serve, and once the product is stored in a freezer for transport, it gets much harder. And, half the fun of going to Pinkberry is picking toppings, so that fun is lost too. So the conclusion on Pinkberry catering? Lackluster, but really, it is an entirely different thing from the shops themselves. The froyo was incredibly tart, and somehow not very strawberry flavored. I did not like it. It was also very hard, as it was being served at an event, not fresh out of the dispenser. It is clear that freezing it in their portable freezers really changes the consistency, as their yogurt is usually pretty creamy and one of the best aspects. The rainbow sprinkles were not very generously applied, and are perhaps the most boring topping they could have picked. I guess no one dislikes sprinkles, but come on, toppings are half the fun! Milky Way is the first chocolate bar produced by Mars, way back in 1923. Amusingly, a Milky Way bar in other countries is quite different, as it lacks the caramel layer that makes it different from a 3 Musketeers. Bars that are most like the Milky Way are actually called Mars Bars elsewhere. So confusing! Anyway, apparently it is named after the fact that it is supposed to remind you of a milkshake ... which makes no sense to me, as milkshakes don't have caramel. Milky Ways are now available in a variety of flavors. “Chocolate nougat layer, soft caramel layer, covered in milk chocolate”. 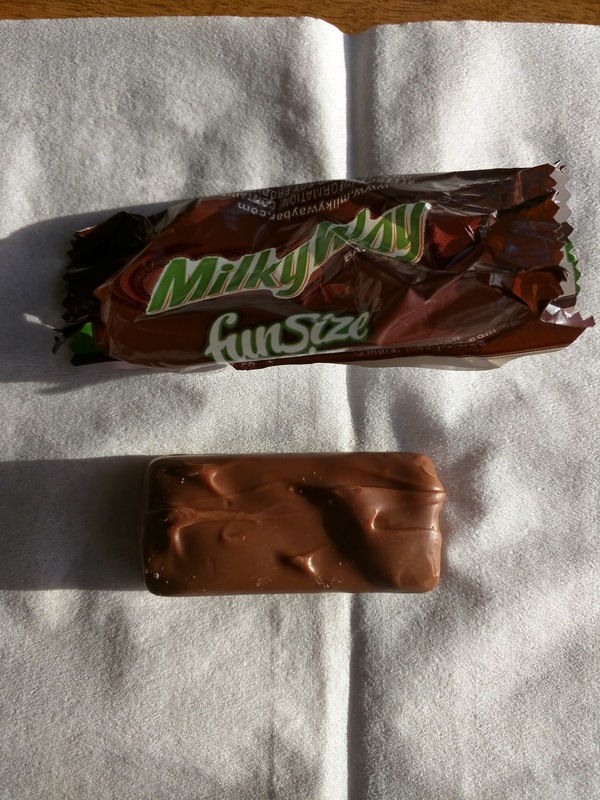 The original, basic Milky Way. First, there is too much chocolate coating. 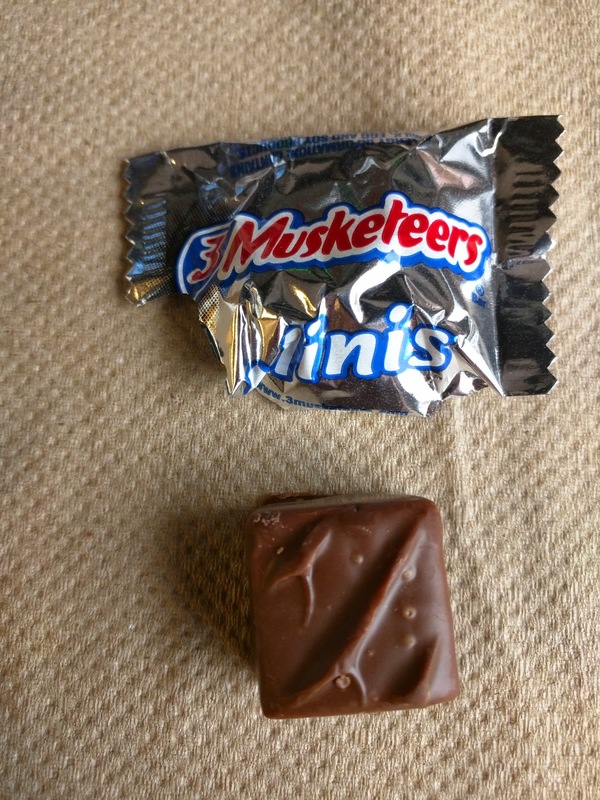 I think having mini/snack size makes this worse, as it throws off the ratios. When the milk chocolate isn't good, even a fairly thin layer overrules. Breaking in, it was just too sweet. I'd like it better with less caramel. 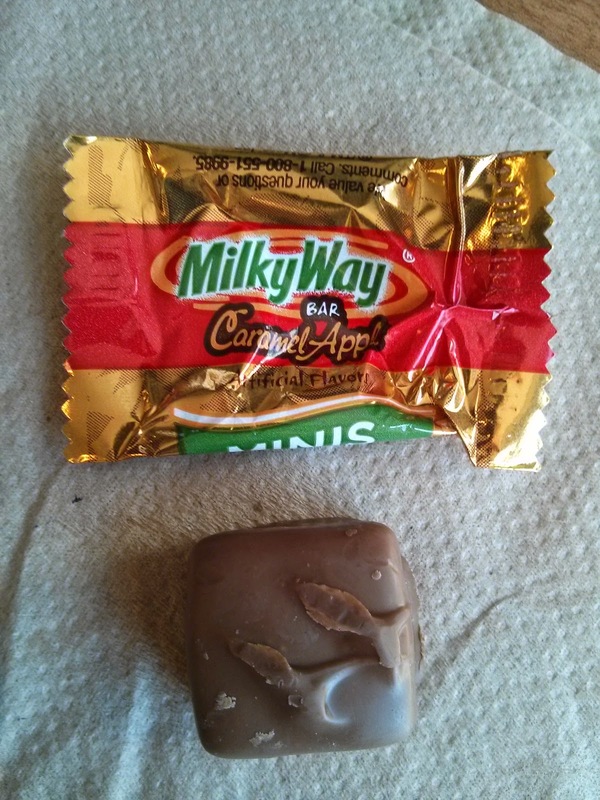 The caramel layer was the thickest layer, but it was a nice soft, smooth caramel. But I'd like less chocolate, and less caramel. So what do I like? The chocolate nougat. Funny because I used to hate these when I was younger, as I never, ever liked nougat. 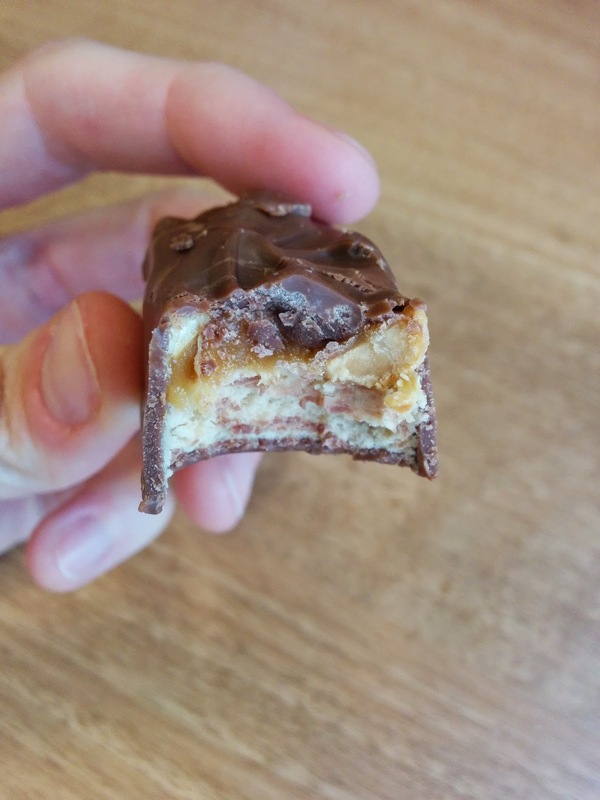 This is basically just a 3 Musketeers, with the caramel layer added. I prefer the plain 3 Musketeers. Crappy "chocolate" coating, way too much flavorless caramel. I do like the chocolate nougat though. Creamy nougat, lots of stringy caramel, fair crappy “chocolate”. Enjoyable enough as a sweet alongside some coffee. 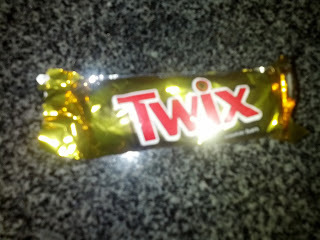 I don't taste chocolate, and the caramel is way too sweet. Just, sweet, sweet, sweet. This sounded tastier than the original Milky Way to me. Dark chocolate is always better than milk, and I actually prefer vanilla nougat. 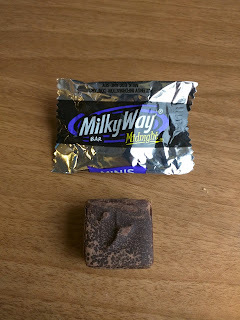 I learned that Milky Ways used to come as two pieces, one chocolate, and one vanilla. They separated them, and re-branded the vanilla one "Forever Yours". Then they discontinued it, and it came back as the Milky Way Midnight. This one got a bit heat exposed, so the surface looked funny, but I knew that wouldn't impact the taste. Biting in, it was exactly what I expected; the same as the regular Milky Way, just with vanilla nougat and dark chocolate. No surprises here. The dark chocolate lacked any complexity, but it wasn't offensive, better than the milk chocolate. The caramel was again smooth and soft, very sweet, and I thought there was too much of it. I almost think it would be better with no caramel at all. The nougat layer didn't taste like vanilla, more like fluffy marshmallow, but that is good too. Not earth shattering, but, again, enjoyable enough with a cup of coffee. Overall pretty decent - the nougat is like a fluffy marshmallow, the caramel is soft and creamy. Super sweet and obviously not high quality stuff, but tasty. Dark chocolate is fairly flavorless, but better than Mars' generic milk chocolate. I like the fluffy marshmallow-like nougat. The caramel is kinda crappy, just sweet, and too much of it. I’d like just the dark chocolate covered nougat more! The dark chocolate looked great, but didn't have any flavor. Vanilla nougat was basically just fluffy marshmallow. Caramel was ok, but I'd prefer without. Not bad, but not very good. "With all the flavor of a red delicious apple dipped in a melted caramel-and-chocolate concoction, this miniature milky way spinoff is a delicious festive treat. 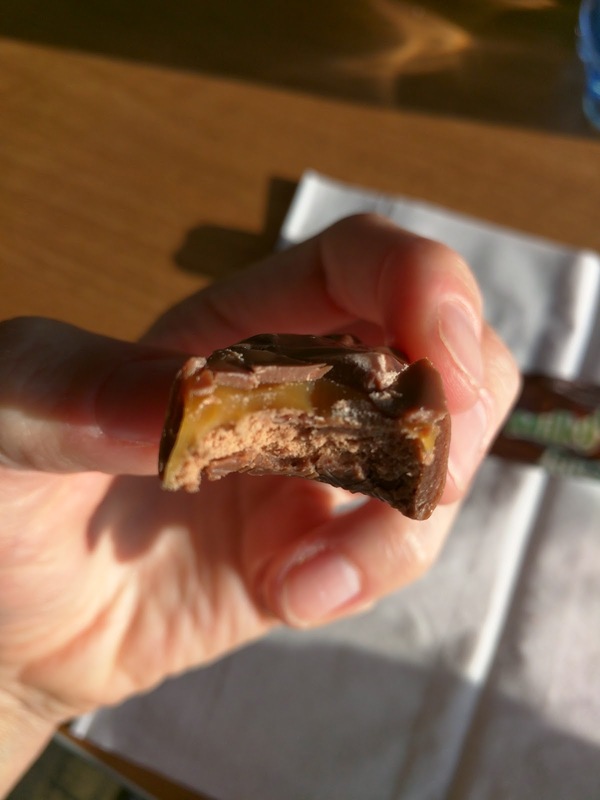 Each bite-size bar encases a ribbon of apple-infused caramel laying delicately over a hunk of chocolate-malt nougat in a soft milk chocolate shell." And finally, a seasonal offering: Caramel Apple! This was shockingly good! The nougat is soft and fluffy, the caramel deliciously "apple spice" flavored, soft, and stringy. The milk chocolate is standard Mars low quality chocolate, but that didn't detract from the sweet goodness of this treat. One of the best seasonal products I've tried, and very nice alongside a cup of black coffee. Reception to these was mixed from my co-workers. One came running out of his office in disgust after he tried on. But another raved about them. And Ojan said they were decent. These clearly are a personal preference sort of item. The second line of candy bars produced by Mars was Snickers, in 1930. Because they seem to like mixing up product names in each country, these bars were known as "Marathon" bars in the UK (which, was not the same as the "Marathon" bar sold here in the US). Seriously, I guess they just didn't think information would flow so freely between countries? Milky Way bars I only ever encountered around Halloween as a child, but for some reason, I have far more memories of Snickers bars. I'm going to guess my mom had something to do with that. To me, a Snickers is the ultimate classic candy bar. I know I used to love them. They now come in a slew of varieties. 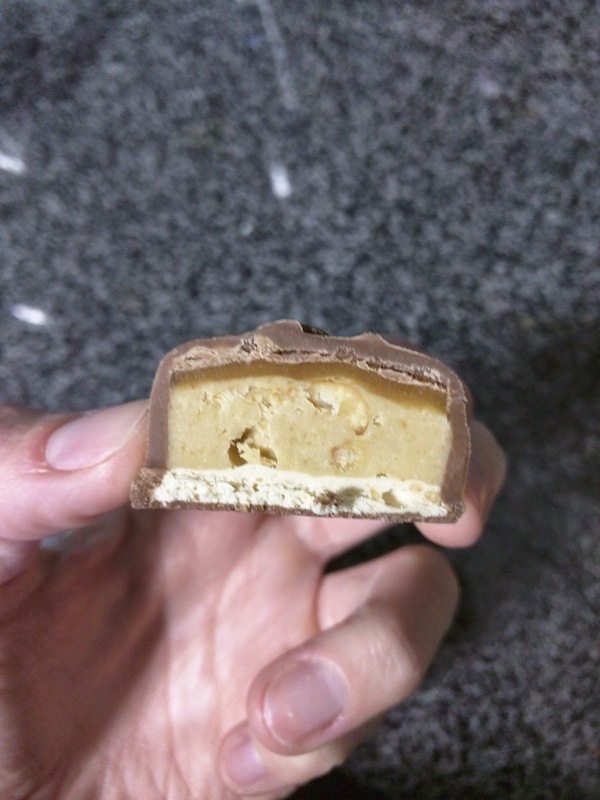 "Milk chocolate coating, nougat layer, peanuts & caramel layer." Let me just say, I used to love these! I really did. But now they seem just sweet, and made with crappy milk chocolate. I really don't know why I used to love these! Crappy milk chocolate, just sweet filling, peanuts. Not really interested in ever having another one! This is very sweet. The nougat is sweet, the chocolate is sweet an uninteresting, the caramel is sweet ... meh. Peanuts were good crunch, but, not particularly interesting nor flavorful. "Almonds, Milk Chocolate, Caramel and Nougat". 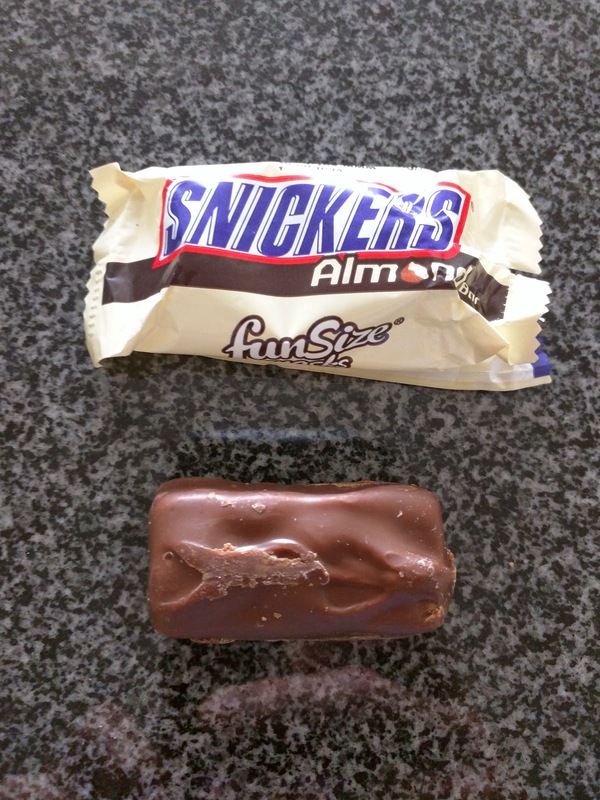 The Snickers Almond is exactly like a regular snickers, except with whole almonds instead of peanuts. 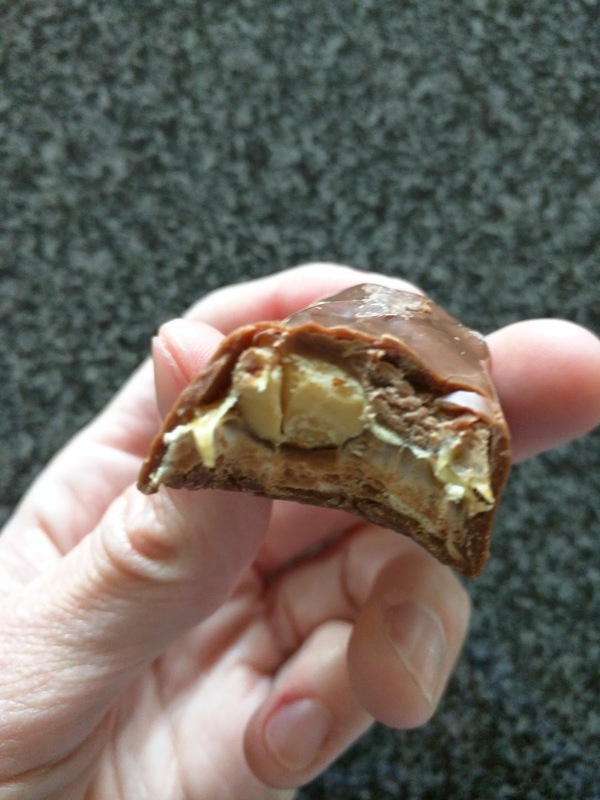 So, milk chocolate shell, nougat layer, caramel layer with nuts in it. My first impression: so sweet! Nougat + caramel = so sweet! 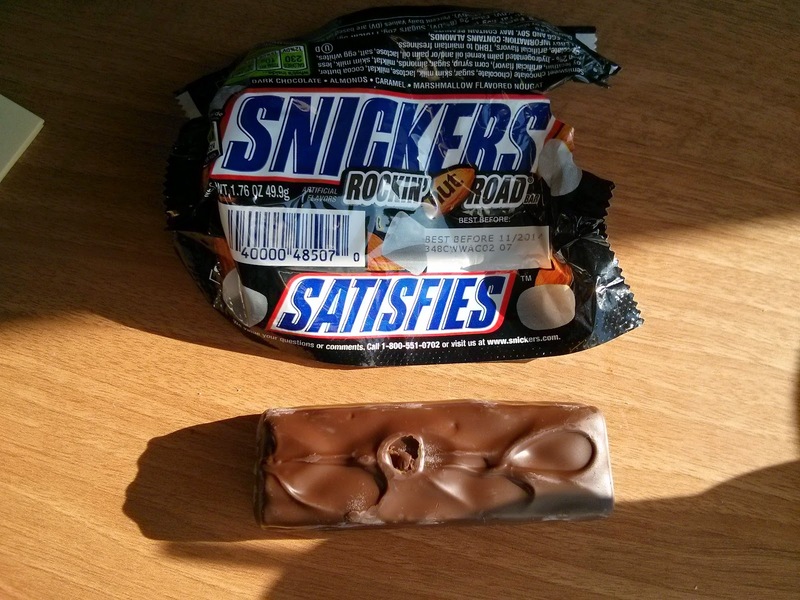 Normally I prefer almonds to peanuts, but in this case, I think the classic Snickers is probably the winner. 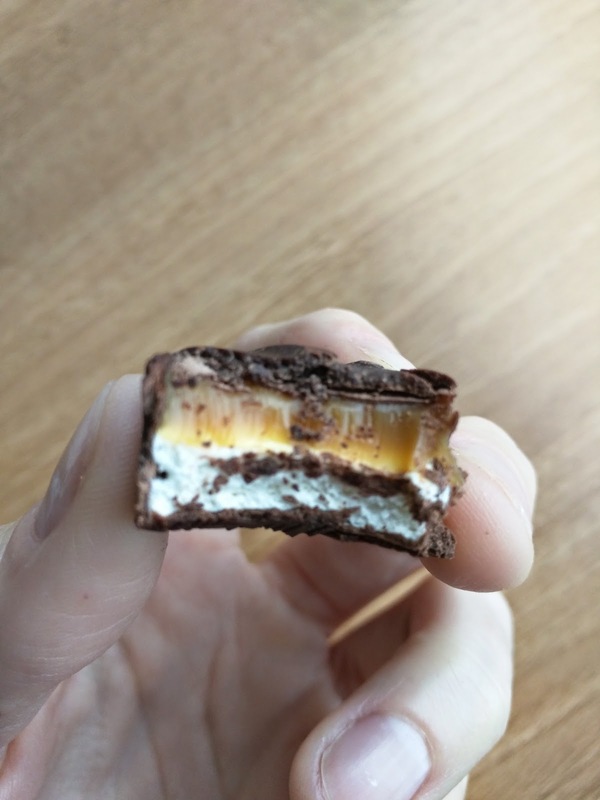 The chocolate layer was thicker than I'd like, but mostly because it is just crappy chocolate, and in mini size, the chocolate to filling ratio was just too high due to the surface size. Update: The next time I had one of these, I really enjoyed it. I absolutely loved the crunch from the large almonds. The caramel and nougat were sweet, but I paired it with a cup of black coffee, and that seemed like a perfect match. The nuts also somewhat tricked me into thinking there was something somewhat healthy about it, and made me really want one as a post-workout snack. "Almonds, caramel, and marshmallow-flavored nougat wrapped in dark chocolate". I thought this was going to be awesome. I like sweet marshmallow flavored things! But, the primary component, that marshmallow nougat, didn't taste like anything. And it wasn't fluffy. And it wasn't even really sweet. It was just ... there. I did like the caramel and the nuts, but besides that, there was nothing going on here. The dark chocolate didn't have any deep chocolate flavor and was pretty boring. It looked much better than it was! "Caramel, nougat, milk chocolate, roasted peanuts and peanut butter squished into square-shaped nuggets." Snickers Peanut Butter SQUARED: Inside. Ok, so you take a regular Snickers. You greatly reduce the caramel layer to a very thin layer across the top. You greatly reduce the nougat to a thin strip on the bottom. And then you stuff it full of peanut butter and peanuts. Keep the same milk chocolate shell. And uh, make it a square. 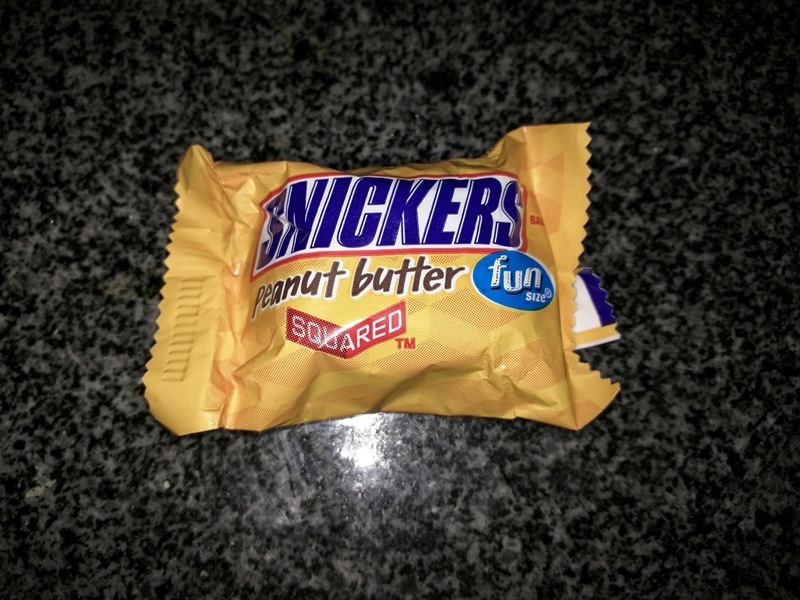 And you get ... Snickers Peanut Butter SQUARED. Why change the shape? I have no idea. 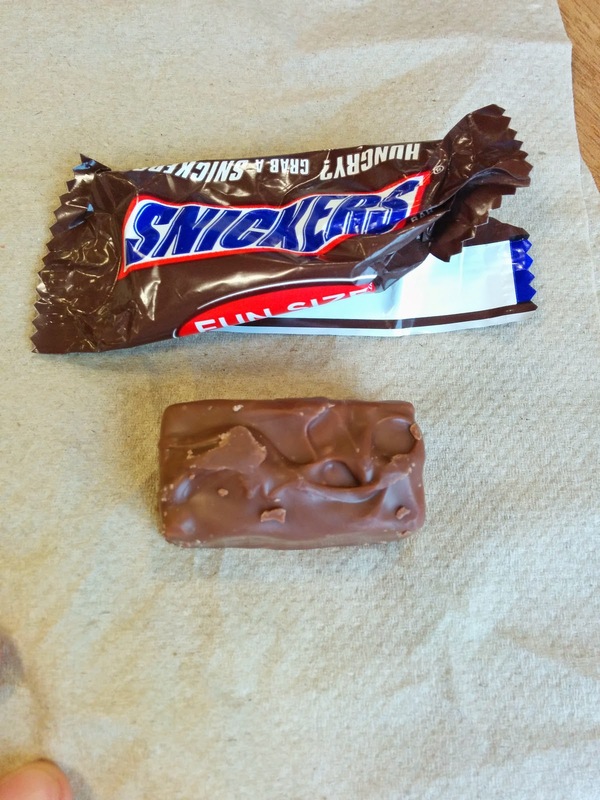 It was the same as a classic Snickers in all the ways you'd expect: same crappy milk chocolate, slightly stale tasting nougat, etc. I guess it did have a bit of additional peanut butter, but this was not very good at all. Update: I enjoyed it more another time. I still did not care for the low end chocolate. The nougat was just meh. The caramel a bit too chewy. And since I never like those components much, I appreciated that they were slimed down. The peanut butter was fairly creamy, and I liked the crunch from the nuts. Better than many other lower end chocolate products, mostly just because chocolate and peanut butter are great together, not because there was anything particularly good about this. 3 Musketeers was the 3rd product ever offered by Mars. They originally came in 3 flavors, chocolate, vanilla, and strawberry, all in once package (hence the name? ), but only the chocolate flavor is offered today. They have experimented with other flavors over the years (orange, raspberry, cherry, etc), but there is a reason you haven't heard of any of these. None but the basic chocolate have stuck. "Delicate, light and fluffy nougat center wrapped in delectable 3 MUSKETEERS® chocolate". Standard fairly crappy Mars milk chocolate coating on the outside. 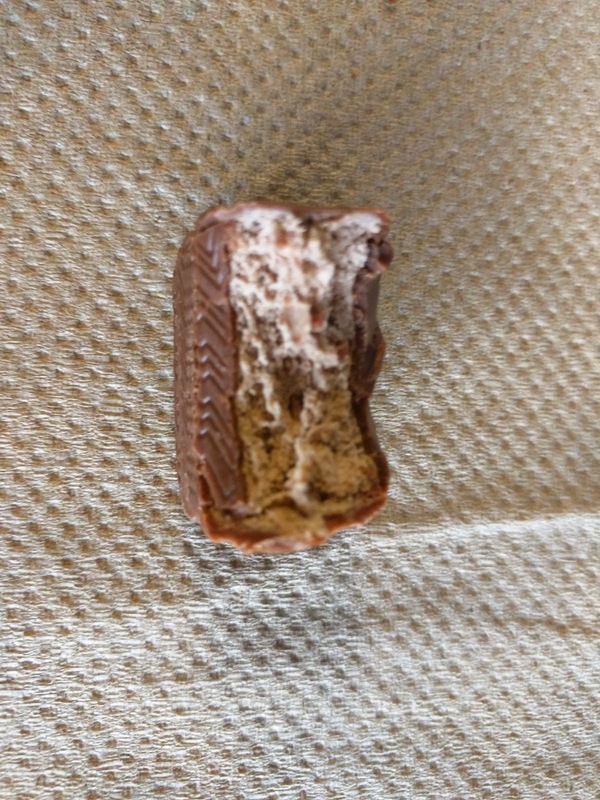 Inside, fluffy chocolate nougat. Very sweet filling, not balanced out by the sweet chocolate coating. But I did like the fluffiness of the nougat. Nice fluffy chocolate nougat. I liked the nougat quite a bit. The chocolate coating was very meh, plasticy and not very good, I wish I could just have the nougat! It reminded me a bit of a marshmallow. Love the slightly chocolately, sweet, fluffy inside, like a chocolate marshmallow. Great with coffee. But who wants their chocolate coating? I almost like the chocolate nougat, but, meh. If only it had decent chocolate on the outside. "Milk chocolate coated caramel and biscuit". Tasting notes: The flavors in this go together well, but they are just too low quality ingredients. Flavorless biscuit, crappy caramel, crappy milk chocolate. Do not like. Ok, M&Ms may be the most classic chocolate candy that there is. Who didn't grow up with a candy bowl full of them? I don't think I ever really thought M&Ms were special, but I know I was partial to the peanut ones. But now? Those magical ones are just low quality chocolate with low quality peanuts. I see how I used to like these, since chocolate and peanuts are so tasty together, but meh. 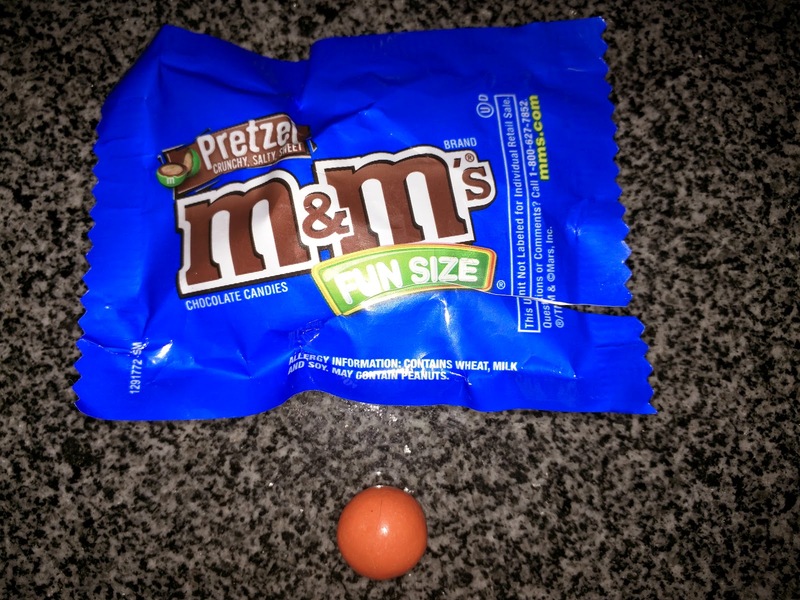 I also tried out "pretzel" M&M's, which sounded fascinating, and looked a bit like peanut M&M's, except more perfectly round. They were also completely uninteresting, I expected some pleasant saltiness from the pretzel to mix with the chocolate, but there was none. Again, dominated by low quality chocolate. Meh.